When asked about artificial intelligence in the ecommerce industry, most people bring up Amazon as a prime example. The tech giant is at the forefront of AI technology, with one of the most advanced chatbots on the market (Alexa, can you order me some ice cream?) along with recommendation engines and fulfillment algorithms that tell supplies what is in demand. However, artificial intelligence isn’t a far-off concept over in Silicon Valley, and it certainly isn’t limited to large companies with big innovation budgets. Keep reading to understand the basics of artificial intelligence in the ecommerce field so you can take advantage of these tools. 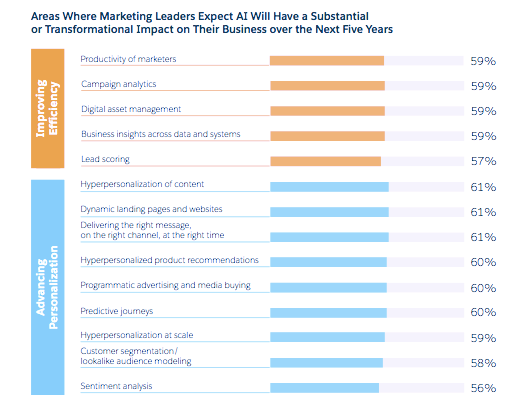 Last year, Salesforce -- one of the top developers and investors in AI technology in the United States -- released its annual "State of Marketing" report which surveyed more than 3,500 marketers about their budgets, expectations, and investments in the upcoming year. These leaders came from companies of all sizes and industries, but had one thing in common: AI was the highest tech investment planned for their departments. More than half (51 percent) of marketing teams already use AI, and 72 percent of high-performing teams use AI for product recommendations and predictive lead scoring. When asked about the benefits of AI to their departments, most marketers and sales teams gave responses that fell into two categories: improving efficiency and advancing personalization. AI is improving efficiency with better analytics and business insights, while creating a more personalized experience through dynamic landing pages, targeted messages, predictive journeys, and customer segmentation. Artificial intelligence alone can’t grow your ecommerce business. However, AI tools related to ecommerce and digital marketing can enhance your promotion and sales efforts to grow your revenue. One of the main reasons more than half of all ecommerce brands are actively invested in AI is because the costs and time requirements to implement the tools are low. AI experts across the country develop AI tools and then sell them as apps or SaaS (software as a service) options. If you have Google Analytics tracking on your website or use various WordPress plugins to run your ecommerce business, then you can handle the technology required to invest in AI. If you’re considering investing in artificial intelligence because “it’s the next great thing” or because you feel pressure from upper-management to try it, then you will likely have a hard time finding tools you like and discovering invaluable AI applications. Instead, look at your business problems first and then see if there are AI options that can do the job better. Start by asking yourself these five questions before you buy a new tool or service, or even start the research process. 1. Are there any outdated technologies you want to replace or upgrade? If your ecommerce business has grown over the years, then you may need to shed old technologies and upgrade to more advanced options. Email marketing is a key example of this. If you mass blast customers or manually segment them through your current provider, you may be ready to upgrade to an AI segmentation tool. These programs will send automated emails based on user behavior or place shoppers in different segments based on their purchase history. In this case, the main expenses will be the cost of the new marketing tool and the onboarding time needed for your email marketer to understand the new software. 2. Is there a tool you wish you had for your ecommerce website? If your existing ecommerce infrastructure meets your needs, but you are in the market for a new tool, consider looking at AI options. There are dozens of product recommendation tools in the WordPress and Shopify app stores. If you are in the market for one of these apps to upsell or cross-sell customers, consider looking into a tool with AI capabilities. This is a great way to learn how AI works in regard to your brand while investing in a service you had already budgeted for that year anyway. 3. Do you really need an AI tool to do your work effectively? Before you make a purchase on a SaaS system or new app, ask whether or not you really need AI capabilities to do the work you need done. If you really only receive a handful of customer service calls per day, then you might not need a pricey AI chatbot to generate sales and leads. This isn’t to say that there aren’t plenty of affordable chatbots on the market, but you might not need one for your brand. Remember: AI adoption for the sake of AI adoption won’t be effective. You have to understand why you want these tools and have clear goals for growing your ecommerce business. 4. Are there more affordable AI tools on the market? We’re all guilty of falling in love with a flashy software platform or getting sold on a certain company at a conference, but it’s important to stay level-headed and shop around. Treat AI like any other marketing tool or investment and research alternatives or brands that are doing the same thing for less. The shiniest AI tool might not be the best one for your ecommerce business. 5. How will you measure the success of your AI investment? Setting a target ROI for your AI investment and creating clear benchmarks for when you expect to see improvement is crucial to understanding whether or not you made a wise AI investment. 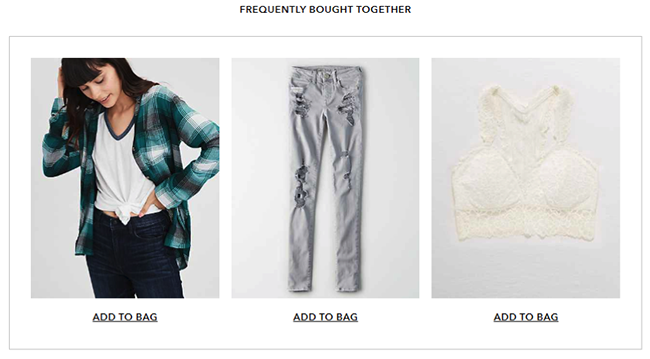 Consider the email marketing example above. A company that invests in AI personalization would expect to see greater sales as a result of these efforts, as well as higher traffic from better emails and re-engaged customers that they otherwise would have lost. These metrics prove the AI tool is more valuable than the option the company previously used. Just because artificial intelligence is popular and exciting doesn’t mean every app or software platform is going to revolutionize your ecommerce efforts. There are plenty of ecommerce tools out there that don’t use AI, and they might be right for your situation. However, if you do choose to invest in artificial intelligence for your ecommerce business, go in with an open mind and know that you don’t have to be the next Bill Gates to implement AI tools for your company.